Locks and keys are not indestructible. Over time they will wear out and break down. If your key wears out before your lock, it is possible that the key could break inside of the lock. This can be a common problem that many people don’t ever think about, but when it does happen, it needs to be fixed right away. When your key breaks off in the lock of your commercial space, you will need the help of an expert locksmith! 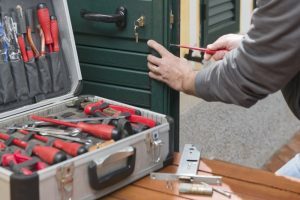 At 24/7 Emergency Locksmith in Allentown, we offer commercial broken key extraction services that can help when you need it. Call us at 484-891-1922 to get started! If you ever find yourself with a broken key in the lock of your business, it is important to act quickly. Leaving the broken key piece in the lock for too long can cause damage to the inner components of the lock. You will also want to avoid trying to remove the key yourself, this often leads to pushing the key piece further into the lock, which, again, could cause damage. The best thing to do is to call your Allentown locksmith experts at 24/7 Emergency Locksmith. We will be able to help remove the key, make you a new one, and determine whether or not the lock is damaged in any way.